“You can win a million dollars but if your digestion doesn’t work, you still won’t be happy.” My yoga teacher repeats this statement at almost every retreat. And while few of us are lucky enough to win the lottery, many regularly deal with painful digestion. Over 100 million Americans suffer from digestive disorders like gastroesophageal reflux disease (GERD), irritable bowel syndrome (IBS), peptic ulcers, diverticulitis, and other gastrointestinal issues. These conditions are painful. Many come with confusing and sometimes embarrassing symptoms, like smoke-in-your-eyes gas and emergency trips to the bathroom. To get to the bottom of such issues, and perhaps even find lasting relief, ancient wisdom tells us to dig deep—to the very foundations of digestion. Ayurveda calls it agni (fire). Strong agni improves vitality, immunity, clarity, and even mood. Ideally, when supported, it easily breaks down the food we eat into high-octane fuel. This fuel is assimilated through the liver and sent to the various layers and tissues of the body. Ayurveda suggests that when the deepest layers are fed well, then we feel vital and energized. We feel good. This good mood is tied to healthy digestion at another level as well. The gut is called the “second brain” because it is responsible for 90% of serotonin production and hosts more than 100-million neurons. When digestion is working well, we process serotonin and stimulate nerves in the gut that influence our state of mind. Good digestion literally can make us happy, biochemically and beyond. According to ayurveda, when agni is weak, food is only partially digested, the liver becomes clogged, and toxins end up in the tissues. We usually feel bad—tired, sluggish, cloudy, and depressed at best, but more times than not, also bloated, gassy, constipated, crampy, and otherwise uncomfortable. The “pain in the gut” is no fun. But it might be a wake-up call to nourish our digestive prowess at its deepest layers. Ayurveda suggests simple lifestyle changes to nourish agni. Eat at regular times, with 4 to 6 hours between meals so that you can fully digest. Choose mainly high-nutrient, easy-to-digest whole foods that are close to their natural state. Spice and combine foods in accordance to the season and your constitution. Relax to reduce stress in all areas of life. Try an elimination diet if you suspect food allergies. Remove common culprits like eggs, dairy, wheat, and corn for 21 days. As you add them back one at a time, if digestion is disturbed it may be a sign to remove the offending item for good. Start each morning with warm, salty, lemon water. And practice yoga techniques like agni sara (essence of fire). Sometimes we need additional support. Enzymes are protein catalysts that turn food into fuel. They are so important to digestion that our body repeatedly recycles them, and some nutritionists even suggest their number determines the length of our life. Enzymes are protein catalysts that turn food into fuel. Historically, we got our enzymes through raw foods—specifically raw dairy, meat, and vegetables. Today, raw dairy and meat are obviously problematic, and raw vegetables can be hard to digest. Instead, we can turn to foods rich in enzymes that are easier to handle. Raw honey is one of the best. So are fermented foods like kefir, cabbage, and kombucha (a kind of fermented tea). Start meals with herbal bitters. Bitter is a taste. You’ve experienced it in coffee, unsweetened chocolate, and greens like arugula. It also is the main taste in many powerful herbal allies. Herbal bitters were traditionally taken 15 to 30 minutes prior to a meal to stimulate digestive juices—getting the right enzymes and fluids in the right place at the right time. Today, we can improve both hot and sluggish digestion with these same bitter formulas. Try tinctures that contain gentian, elecampane, yarrow, and wormwood, all cooling herbs. If you suffer from cold and sluggish digestion, make sure the formula includes warming carminatives like fennel, orange peel, or ginger. The gut is populated by 500 to 1,000 different symbiotic species of friendly bacteria that assist the digestive process. If those bacteria are killed—either from chlorinated water, heavily processed foods, antibiotics, or stress—unfriendly bacteria can take their place, causing bloating, constipation, and pain. Whole, fresh yogurt made from real milk is one of the best ways to repopulate the gut flora. If it is not available, try a probiotic supplement. Make sure the probiotic comes from a reputable source. A good probiotic must be refrigerated to remain viable. Like any living organism, gut flora must be fed to survive and thrive. Herbs and foods that feed gut flora have recently been termed “prebiotics” and can move through the digestive process mostly intact. Try herbs like dandelion, burdock, and elecampane roots. Lucky for us, several prebiotic herbs are also bitters and benefit the liver. The liver is responsible for over 30 functions, like assimilating nutrients and clearing toxins. To work well, it must be maintained, cleansed, and nourished. Traditionally, the first wild greens of spring were used to cleanse toxins and stagnation from the liver. Today, we can recreate that natural process by incorporating dandelion leaves into our spring routine. A tincture or decoction of burdock, dandelion, and yellow dock roots will also gently cleanse and nourish the liver. Chronic digestive distress is not something we should have to live with. It clouds not only big things (like winning the lottery!) but also the small pleasures, like springtime flowers and warm breezes. In the wise progression of health, we can address painful symptoms while at the same time building strong digestion from the ground up. Chronic digestive distress is not something we should have to live with. May this cleansing and building help you feel lighter, brighter, and more on fire as you step into the beauty of your life. This article contains general information about medical conditions and complementary treatment, and is not to be considered expert advice. Always consult your physician and other qualified healthcare provider before beginning any new treatment, diet, or fitness regimen. 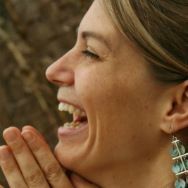 Jackie Dobrinska is the “Herbal Yogini” and a wise woman practitioner at A Simple Vibrant Life (asimplevibrantlife.com). You can reach her at jldobrinska@gmail.com or by phone at 828.337.2737. [1.] According to Michael Gershon author of The Second Brain.